INDIANAPOLIS, Ind., Aug. 5, 2009 – Eight 2008 U.S. Olympians are among the athletes competing in the 2009 Visa Championships, Aug. 12-15, in Dallas Texas: Olympic all-around champion Nastia Liukin of Parker, Texas; Olympic team silver-medalists Chellsie Memmel of West Allis, Wis., Samantha Peszek of Indianapolis, Ind., and Bridget Sloan of Pittsboro, Ind. ; Olympic horizontal bar silver-medalist Jonathan Horton of Houston; Olympic team bronze-medalists Alexander Artemev of Highlands Ranch, Colo., and Joey Hagerty of Albuquerque, N.M.; and Chris Estrada of Lafayette, La., the first U.S. man to compete in trampoline at the Olympics. 2009 World Games mixed pairs champions Kristin Allen and Michael Rodriques of Livermore, Calif., top the acrobatic gymnastics field, and Chicago Cup silver-medalist Julie Zetlin of Gaithersburg, Md., is competing in rhythmic gymnastics. The 375-person field includes 19 athletes from the Dallas-Ft. Worth area and 57 from Texas. A total of 32 states are represented in the field, with California’s 85 coming in at the top. A complete list of the field, by state and then by discipline, is included below. Athletes are competing for U.S. titles, as well as berths on the national team for each discipline. The women’s field is a mixture of returning veterans and rising stars. In addition to the four Olympians, two 2008 Olympic alternates are also competing: Jana Bieger of Coconut Creek, Fla.; and Ivana Hong of Lovejoy, Texas. In Beijing, Liukin won five medals, the most by any female gymnast: the all-around gold medal; silver medals on the balance beam, uneven bars and in the team competition; and a bronze on floor. Liukin and Peszek both used the recent CoverGirl Classic as a tune-up, finishing second on the balance beam and vault, respectively. Sloan claimed the silver medal in the all-around at the 2009 Tyson American Cup and went on to win the all-around gold medal in international competitions in France and Germany. The Visa Championships will be Memmel’s first competition since the 2008 Games. At the CoverGirl Classic, Hong was second in the all-around and won the beam title. National team members Rebecca Bross of Plano, Texas, and Alaina Johnson of Tyler, Texas, are returning to competition. Here are some of the senior national team members who have had success earlier this year and are expected to compete: Mackenzie Caquatto of Naperville, Ill., finished second in the all-around at the USA –France and USA-Japan friendly exchanges; Olivia Courtney of Orlando, Fla., won the gold medal on floor and the silver medal on vault at the PAGU Championships, in addition to capturing the all-around title at the CoverGirl Classic; Kytra Hunter of Frederick, Md., won floor at the USA-Germany event; and Cassie Whitcomb of Colorado Springs, Colo., won the uneven bars title at the CoverGirl Classic. Performances at the Visa Championships will determine which women will be invited to the World Team selection camps in September. In addition to the returning Olympians, defending U.S. all-around champion David Sender of Arlington Heights, Ill., will take the floor, fresh off his success at the recent Maccabiah Games. The U.S. Men’s Team for the 2009 World Championships in London will be named after the conclusion of the Visa Championships. This will be Artemev’s first competition since Beijing; and Horton returned to the competitive scene at the 2009 Japan Cup. Here’s a look at some of the recent accomplishments of gymnasts in the men’s competition: Guillermo Alvarez was fourth in the all-around at the 2009 Winter Cup and third on floor at the 2008 Toyota Cup; Hagerty, who was third at the Tyson American Cup, won the all-around at the 2009 Winter Cup Challenge and is third in the all-around rankings for the Champions Trophy series in Germany; Steven Legendre of Flower Mound, Texas, won the all-around at the NCAA Championships and the bronze medal on vault at the Japan Cup; Danell Leyva of Miami finished second in the all-around at Winter Cup, was fourth on high bar at the World Cup and won the horizontal bar title at the PAGU Championships; and Sender was second in the all-around at the 2009 Tyson American Cup and won five medals at the recent Maccabiah Games (gold on rings, vault and high bar; silver in the all-around and pommel horse). 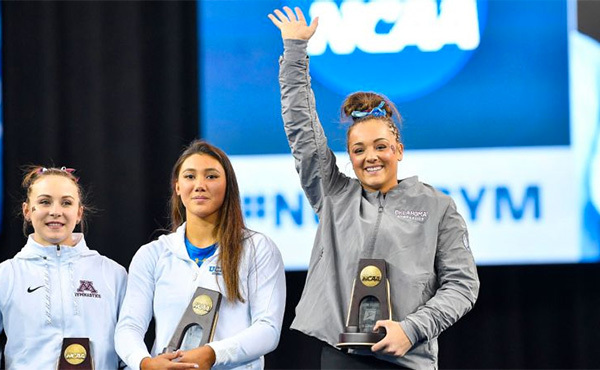 With the retirement of 2008 all-around champion Lisa Wang, Ava Gehringer of Evanston, Ill., Rachel Marmer of Irvine, Calif., and Julie Zetlin of Gaithersburg, Md., are among the gymnasts vying for this year’s top honors. More than 40 rhythmic gymnasts are expected to compete in Dallas. At the Chicago Cup in June, Zetlin and Marmer finished second and third, respectively, in the international competition. Earlier this year, Marmer won the Rhythmic Challenge, with Gehringer finishing second and Zetlin third. At last year’s Visa Championships, Marmer was second followed by Gehringer and Zetlin in third and fourth, respectively. Estrada, who is the defending U.S. men’s trampoline champ, is one of more than 80 junior and senior trampoline and tumbling athletes who are competing for national titles and hoping to earn points toward the U.S. Trampoline & Tumbling National Team and for the 2009 World Championships or World Age Group selection. Others to watch include Steven Gluckstein of Atlantic Highlands, N.J., who won the 2009 Winter Classic, Frivolten Cup and U.S. Elite Challenge, and Logan Dooley of Lake Forest, Calif., 2008 Olympic alternate. 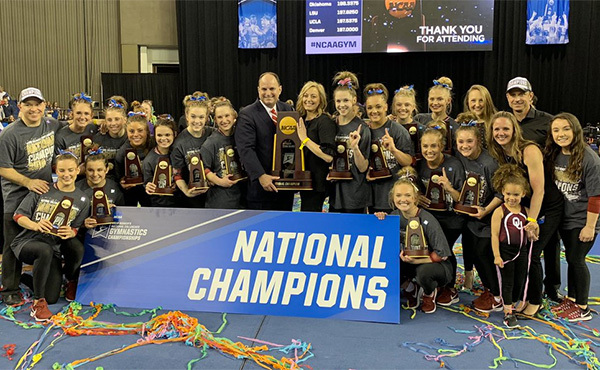 In women's senior trampoline, Alaina Williams of Huntsville, Ala., recently won at the Frivolten Cup and U.S. Elite Challenge, and Honolulu’s Nani Vercruyssen took the Winter Classic title earlier this year. 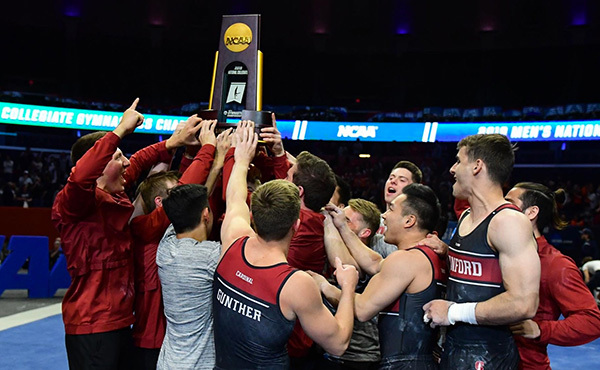 Kalon Ludvigson of Pocatello, Idaho, will defend his title in men’s tumbling and challenge men’s double mini-trampoline defending champion Austin White of Newport Coast, Calif. Another challenger in double mini is Stephen Raymond of Orlando, who claimed the 2009 Winter Classic title. 2008 women's tumbling champion Kaitlin Tortorich of Haymarket, Va., faces fellow 2007 World Championships team gold-medalists Yuliya Hall of Idaho Falls, Idaho, and Leanne Seitzinger of Stafford, Va.
Rodrigues and Allen, the first U.S. acrobatic gymnasts to win a World Games gold medal, also won the all-around title in the World Cup mixed pairs competition at the 2009 Freedom Cup. The pair, who earned the silver medal at the 2008 World Championships, is shooting for their second straight U.S. title. The women’s group Kailey Maurer of Fontana, Calif., Holli Morris of Beaumont, Calif., and Crystal Johnston of Riverside, Calif., recently captured the gold medal at the 2009 Freedom Cup. 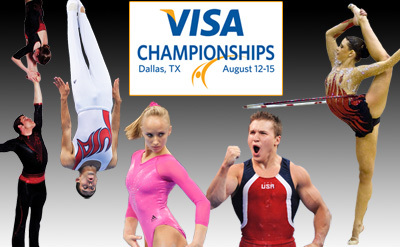 2009 is the Visa Championships’ first visit to Dallas, and the first time the event has featured all five of USA Gymnastics’ competitive disciplines – men’s and women’s gymnastics, rhythmic gymnastics, trampoline and tumbling, and acrobatic gymnastics. The Visa Championships determine the U.S. champions and the national team for each discipline for both the junior and senior elite levels. NBC Sports will broadcast action from men’s and women’s gymnastics. The American Airlines Center is hosting men’s and women’s gymnastics, with rhythmic and acrobatic gymnastics and trampoline/tumbling at the Dallas Convention Center. Single session tickets are on sale now. Tickets may be purchased by phone at 800-745-3000; online at www.ticketmaster.com; at all Ticketmaster outlets; or at the American Airlines Center Ticket Office. All-session tickets for rhythmic gymnastics, acrobatic gymnastics, and trampoline and tumbling at the Dallas Convention Center may also be purchased via Ticketmaster. In recognition of Visa’s longstanding support of USA Gymnastics, the 2009 Visa Championships proudly accepts only Visa cards. Here’s a quick look at the schedule the Visa Championships. Aug. 12 Junior rhythmic all-around qualifier and individual event finals/Dallas Convention Center 9 a.m. Junior men’s gymnastics/American Airlines Center 1 p.m.
Senior rhythmic all-around qualifier and individual event finals/Dallas Convention Center 3 p.m.
Senior men’s first day of competition/American Airlines Center 7 p.m.
Aug. 13 Trampoline and tumbling, and acrobatic gymnastics prelims/Dallas Convention Center 9 a.m. Junior women’s first day of competition/American Airlines Center 1 p.m.
Senior women’s first day of competition/American Airlines Center 7 p.m.
Aug. 14 Junior and senior rhythmic all-around finals/Dallas Convention Center 9 a.m. 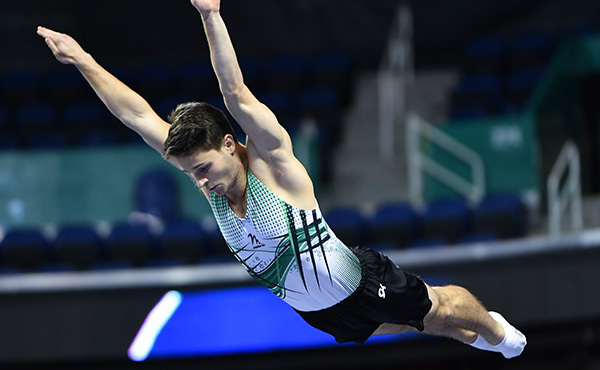 Junior and senior trampoline and tumbling finals/Dallas Convention Center 3 p.m.
Senior men’s second day of competition/American Airlines Center 7 p.m.
Aug. 15 Rhythmic all-around/trampoline & tumbling/acrobatic gymnastics finals/Dallas Convention Ctr 11 a.m. Junior women’s second day of competition/American Airlines Center 1 p.m.
Senior women’s second day of competition/American Airlines Center 6:30 p.m. The USA Gymnastics National Congress and Trade Show is held in conjunction with the Visa Championships and will be conducted at the Sheraton Dallas Hotel. The USA Gymnastics National Congress and Trade Show is the annual gathering of professional members that offers educational and business sessions, a large exhibitor’s hall and other business and educational opportunities. In 2008, Shawn Johnson of West Des Moines, Iowa, and Sender won the coveted U.S. all-around titles. The roster of former U.S. all-around champions includes many of the best-known and well-loved names in gymnastics: women –Liukin, Carly Patterson, Courtney Kupets, Shannon Miller, Dominique Dawes, Kim Zmeskal and Mary Lou Retton; and men – Paul Hamm, Blaine Wilson, John Roethlisberger, Mitch Gaylord, Peter Vidmar and Bart Conner. The Visa Championships traces its history back to 1897 for the men and 1931 for the women. At the 2008 Visa Championships, Lisa Wang of Buffalo Grove, Ill., swept the rhythmic gymnastics all-around and all four individual events. In trampoline and tumbling, the 2008 U.S. senior champions were: Estrada, men’s trampoline; Alaina Hebert of Broussard, La., women’s trampoline; Dooley and Gluckstein, men’s synchronized trampoline; Erin Blanchard of Lafayette, La., and Hebert, women’s synchronized trampoline; White, men’s double mini-trampoline; Aubree Balkan of Carlsbad, Calif., women’s double mini-trampoline; Kalon Ludvigson of Pocatello, Idaho, men’s tumbling; and Tortorich, women’s tumbling. Winning U.S. senior crowns in acrobatic gymnastics in 2008 were: Nicole Barrilleaux of Metairie, La., and Alexis Thibodeaux of Harahan, La., women’s pair; Allen and Rodrigues, both of Livermore, Calif., mixed pair; Hannah Busha, Steffi Scheid and Mariah Spray, all of Livermore, women’s group. 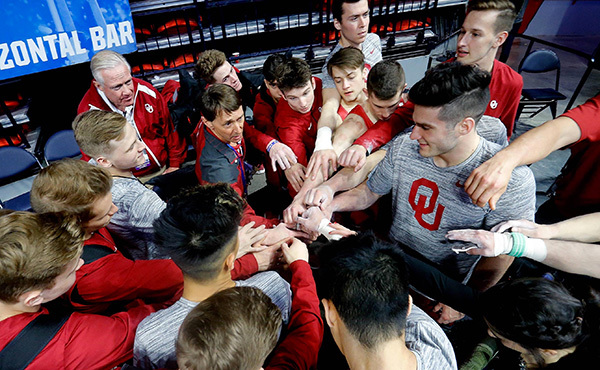 Both men’s and women’s gymnastics will have two days of competition at American Airlines Center, which has hosted the post-Olympic tour for gymnastics. Anchoring the 72-acre Victory Park development, American Airlines Center serves as the backdrop to Dallas' most vibrant urban gathering space. In addition to being home to the Dallas Stars and Dallas Mavericks, American Airlines Center has hosted several prominent events, including the 2007 NHL All-Star Game, NBA Finals, Big 12 Championships and the 2003 USFSA National Figure Skating Championships. The Dallas Convention Center, which has more than 1,000,000 sq. 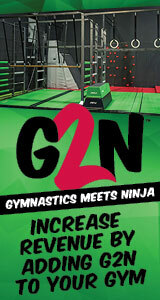 ft., is the site for rhythmic and acrobatic gymnastics, trampoline and tumbling. The Dallas Convention Center offers a staggering 726,726 square feet of prime, contiguous exhibit space along with a 203,000-square-foot column-free exhibit hall, the largest in the United States. Plus, the Dallas Convention Center offers even more great features, such as a 9,816-seat arena, a theater with a 1,750-person capacity and 96 meeting rooms.